The impact of substance use is not uncommon for communities and populations across Canada. The harms and issues associated with substance use can be complex and multidimensional, having implications for the economy, justice and enforcement sectors, as well as the social and physical health of individuals and their communities. The economic cost of substance use in Canada in 2014 was estimated to be $38.4 billion. This estimate represents a cost of approximately $1,100 for every Canadian, regardless of age. Legally available psychoactive substances, tobacco and alcohol, contributed over two-thirds of these costs, and there were increasing costs associated with opioids and cannabis between 2007 and 2014. 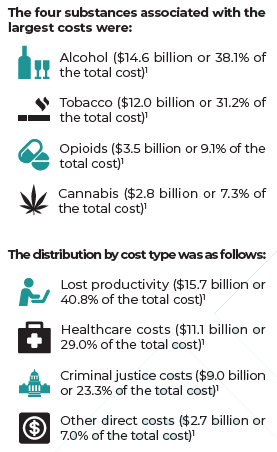 The productivity losses related to substance use amounted to 41% of the total cost; while the costs associated with healthcare and criminal justice continue to be significant. For more information on the social costs and harms associated with substance use, please refer to the Pillar summaries. Together, this information will help to inform policy decision making and resource allocation for law enforcement, prevention, treatment, and harm-reduction services in the three counties.